The Wilson weBoost Drive 4G-X Cell Phone Booster Kit – 470510 includes the most powerful vehicle booster made by Wilson Electronics. This signal booster kit is able to boost the signal of multiple users in a single vehicle simultaneously. 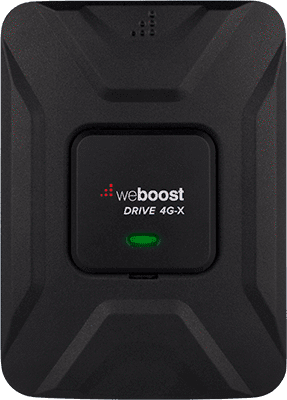 This weBoost Drive 4G-X signal booster boosts the signal in most types of passenger vehicles including cars, trucks, SUVs and even RVs and boats. The Wilson weBoost Drive 4G-X is the most powerful signal booster made by Wilson. In fact, this is the amplifier many truck drivers and first-responders use for professional use. This booster can amplify cellular signals up to 32x the signal you would normally experience! With the boosted signal, your phone doesn’t have to search for signals, which can extend your battery life dramatically. Better signal, improved call quality, and longer battery life! What’s not to love? The Wilson Drive 4G-X receives the signal through the included antenna and delivers that signal to the booster. The booster then amplifies the cellular signal to provide you the strongest signal possible, in any area. This device does not require your phone to make contact with or rest on the booster, so you are able to use your device more comfortably. In addition, more than one person can use the booster at once. Multiple users can receive a strong, boosted signal at the same time. Perfect for long family trips or carpools! Everything you need to install your new signal booster is included with your order. Instructions are included. DIY signal booster installation! If you have any questions or concerns, you can contact our customer support team. We are always happy to assist you.